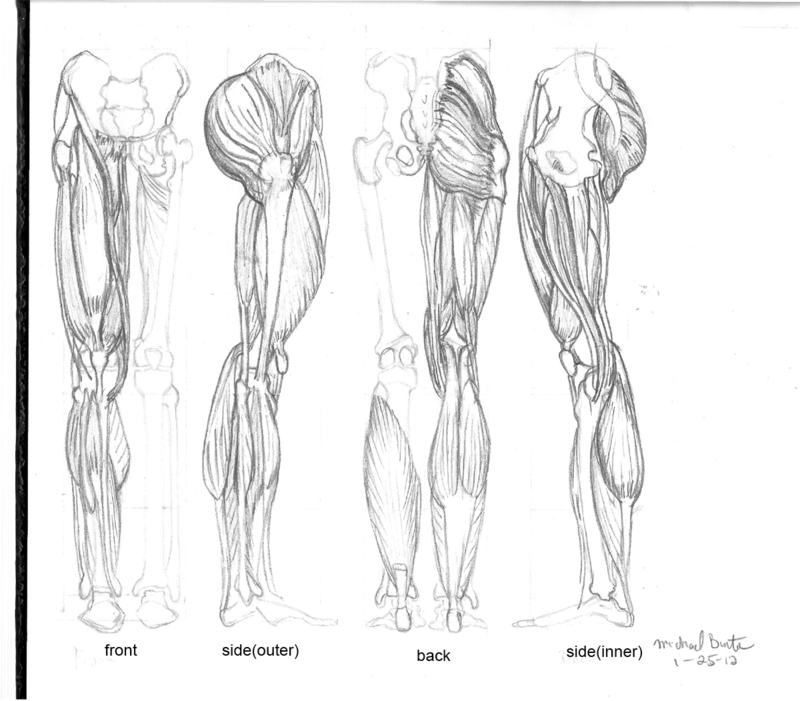 Here is the last stage of the leg muscles. I know I didn’t touch the foot much, I will do a study of the foot by itself. I decided that I will draw the entire skeleton figure as large as possible and add more details in the rendering with that project. Once again, I followed along with Riven Phoenix on constructing the proportions with and 8 head tall figure; I studied from Rubins anatomy book for the actual organic shapes of the bones and muscles. 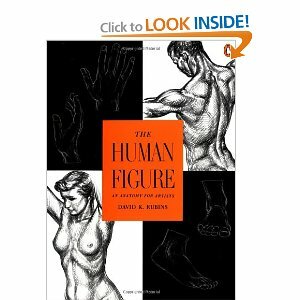 Below is a link to purchase or review David Rubins Figure Drawing book. This is part III of layering the muscles over the bones of the legs. The leg, like the arm is very complex. 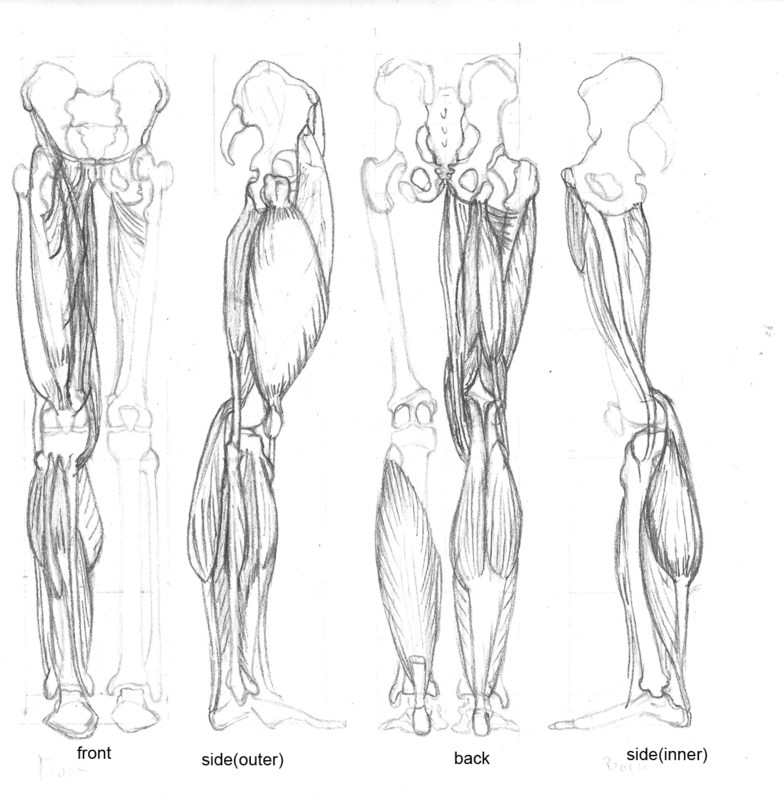 It best to find the larger shapes that make up the overall form and structure of the leg. The course’s focus is an introduction to observe & invent the human figure; it includes over 200 slides of great art with commentary and comparisons between anatomy plates and finished works. The course showcases the work and teaching of George Bridgman, and his influence on illustrators such as Frank Frazetta. Also, what makes this anatomy workshop unique is, the way Vandruff teaches you to really observe anatomy by showing the contrast of two completely different approaches to studying anatomy. One approach is the form and simple shapes; second more completed and finely detailed renderings from another artist. Lastly, he shows a way to quickly remember the names of the bones and muscles as well as where they’re located. I checked out this website from the Artist Zack Petroc. Zack is a gifted individual in the art and entertainment field; working with Disney and Paramount to name a couple. He has some excellent resources on the human anatomy, that he created in Z Brush. He gives an hour lecture on the human skeleton and muscles as well as 3D models of the skeleton and muscles to study inside the Z Brush 3D modeling program. To find out more about Zack and his Anatomy Tools check out his website link below. Artist and Instructor Michael Hampton is releasing a revised 2011 edition of his remarkable book on figure drawing, anatomy, design and invention. I was very pleased and gained so much insight from Hampton’s mastery, experience, and theory on the human figure. This book is hard to get a hold of since its’ self published by the author. My advise is to get it as soon as it hits the online stores. Also, This is a must have book for anyone that want to take their figure drawing to the next level. Check out further information below! 4th edition coming out September 2011! The 4th edition has updated chapters on drawing the arms and legs. Also, check out this Q & A with Michael Hampton featured on CG Masterclasses. On my continued journey to become a master artist, I found another phenomenal online drawing tutorials and art resources; The Drawing Tutorials Online with Matthew Archambault. Matt is not just an instructor, he’s an instructor at The School of Visual Arts in New York. He’s also worked as a professional Illustrator for nearly 18 years;He has been represented by some of the biggest agents including Hankins and Tegenborg, Bill & Maurine Klimt as well as Scott Hull. Matt is ready to share his knowledge and expertise gained by completing hundreds of illustration projects. Drawing Tutorials Online with Matt has been a ground breaking experience for me. In just a couple of weeks I have gained a much better understanding with portraits, lighting, painting, drawing the figure, and form. I was very impressed with the large amount of content he has on various topics covering art. He draws and talks at a nice steady pace so you don’t have confusion or questions about what he is doing. If you want to be an illustrator, concept artist, medical illustrator, etc. or just want to improve, I would highly recommend this site before a lot of the other online sites; My reasons for saying this is because of the affordable price, amount of info and demonstrations you get; it will have you well prepared to further studies in concept art and any other advanced creative fields; you will have a great solid foundation on art , drawing, and theory. I recently checked out this book “The art of drawing people. 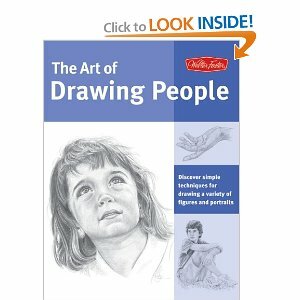 This a great book on learning to draw people(portraits, figures, etc.). It is broken down into 5 sections. Four of the sections are broken down by 4 different skilled artists. The first section gives a brief introduction for supplies, basic principles for drawing, composition, etc. The second section is discussing and illustrating anatomy. The third section covers faces with a simple style approach. The fourth section covers people, using formulas for faces, anatomy, very realistic, etc, The fifth section covers other sections and approaches to drawing people. One of the other great features in this book is the diversity of step by step drawing of people; covering very young children, teens, young adults, mature adults, elders and many different ethnic backgrounds. This is one of those books that will be in constant use for many years. After completing the entire training series I can give a more thorough review. Riven Phoenix presents a unique way of thinking and breaking down the human body in your mind. 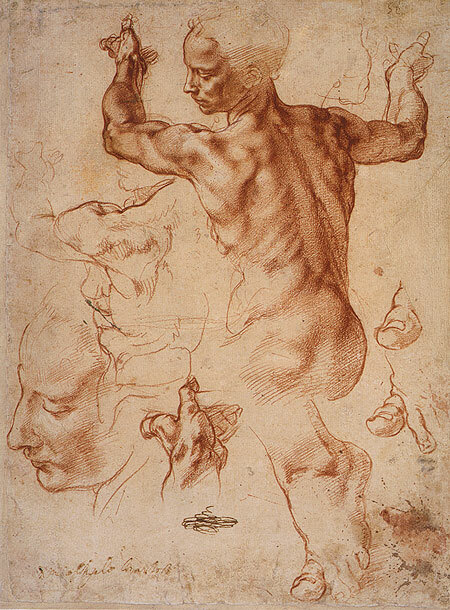 He states clearly that this is a GENERAL approach(meaning generic) approach to drawing the figure. Inventive drawing(Phoenix) is different from drawing what you see(life drawing). Most of his lessons are only 7-15 minutes; so you’re not going to get a super dynamic demonstration but a general idea and general observational approach.. It has helped me a lot. I’m not a concept artist but have decided to explore and try to get into it now. I have some formal school training with live models and Illustration but I need to expand my knowledge of the figure. My biggest problem was always seeing the figure as a complex subject. I needed to find a different approach to figure drawing. Studying Phoenix’s approach, combining my studies from life drawing, and drawing what I see, is helping me bridge the gap. Now, I can make more sense out of what I’m drawing by adding an abstract (generic approach along with using a more consistent study tools of great anatomy books and life drawing). Final thoughts: Riven Phoenix has a good niche for what he does to help certain types of artists. Depending on your level of understanding this series may or may not help you. It has definitely helped me and yes I would recommend it. The best way to learn is to go along with his tutorials but also reference back with a good anatomy book to sharpen and enhance your studies. His techniques are good for helping work out your characters and figures. You would use this for a solid understanding when creating and working out your characters; especially when you have to work quickly and meet deadlines. When you think about it, if your drawing out storyboards or character sheets for a company, you just need the general (basic) idea of anatomy to get your ideas flowing quickly. Anatomy for life drawing is just that; realistic, detailed and accurate drawings for anatomy only, not necessarily for commercial entertainment. A good contrast is myself and my best friend. I’m pretty descent with drawing portraits and likenesses from life and photos. My buddy is better with inventing out his head. He didn’t have patience with drawing from life; he’d rather look at a person for a while, and then go home and re-invent the image from his head and get a likeness. So it really depends on where you’re at as an artist and being open with other perspectives on learning to better yourself. I give The Riven Phoenix Structure of Man DVD drawing course 5 stars. Also, don’t think that this is the only series that you need to study to achieve mastery. This is groundbreaking, but this is just the beginning. Practice, Persistence, Passion, Patience, Love, and an Open Mind will all play a part in achieving a mastery level of drawing the figure from your mind. In this example, I illustrated a generic version of the human skeleton. Once I got through the front, side, and back view of the skeleton; I began to understand the figure at a faster pace. ke note of the proportions of each section of the body in relation to the size of thes skull.